SEVERE WEATHER CONDITIONS since August have left farmers across Ireland on the verge of a serious fodder crisis. Farmers usually purchase enough fodder – dried hay or feed given to cattle and livestock – to last until the spring when the grass begins to grow and animals can begin to eat that instead. However, the unexpectedly cold and wet summer and winter has meant that farmers are running out of hay earlier than usual and grass has not grown enough to meet the needs of the animals in many parts of the country. It has particularly affected the west and north-west of the country the worst. President of the Irish Farmers’ Association (IFA) Joe Healy told TheJournal.ie that a fodder crisis last year has had a significant knock-on effect on this winter’s supply. “2016 was a very difficult year for fodder. There were no reserves left in any yard. Usually, there is some left over but that’s not the case this year,” Healy said. Healy explained that a lot of farmers in the west and north-west of the country were able to secure their first cut of silage of the year, but very few were able to get a second. Silage is fermented, high-moisture stored fodder which can be fed to cattle and sheep. “It’s a very serious situation. It’s just gotten progressively worse. You don’t want your animals to be hungry,” Healy said. Healy and a number of TDs are calling on the Minister for Agriculture Michael Creed to address the deepening crisis and implement a fodder scheme to establish a fund for affected farmers. A meeting has been scheduled for 1 December to address the fodder crisis. However, Healy noted that Creed indicated he could not attend on that date due to a prior engagement. In relation to the implementation of a fodder scheme, Healy said that “Minister Creed should get on with it and introduce one immediately”. “Farmers who are under extreme pressure because of the challenges facing them expect a strong response from the Minister and the Government,” he said. Speaking in the Dáil on Tuesday, Minister Creed said that Teagasc assessed the fodder supply in Ireland currently and that “2017 was, in fact, a record year for grass growth and that there is sufficient fodder in the country. If there is to be a scheme it has to be one that is based on the evidence on the ground for the Department officials and Teagasc, which is in the farmyards in the regions concerned. That process is underway. I am satisfied that there is sufficient fodder. 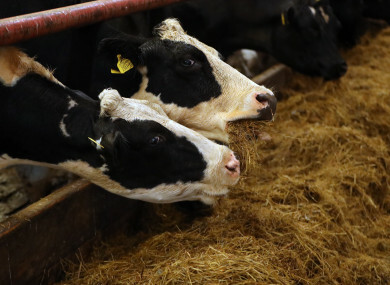 Fianna Fáil agricultural spokesperson Charlie McConalogue said it is the government that is “walking us into another fodder crisis” because it is failing to take action to respond the issue. The minister’s refusal to acknowledge the reality on the ground is a clear indictment of just how out of touch this government is with small farmers and rural Ireland. “The situation is particularly bad in the north-west and west, but fodder shortages have now spread to the border counties, midlands and mid-west,” McConalogue said. The Department of Agriculture has been contacted for comment. Email “Farmers are calling a fodder crisis ...but the government says there is sufficient supply”. Feedback on “Farmers are calling a fodder crisis ...but the government says there is sufficient supply”.